I am always very impressed by the ability of Indian working class men to sleep absolutely anywhere. Pavements, park benches and beaches are not just the (unfortunate) domain of the destitute or drunk. If an Indian man wants or needs to go to sleep - then he's gonna go to sleep. Right there and then. On the sidewalk, on a broken wall, on a dirty beach, on a rare park bench. I have seen them curled up in tuk-tuks, horse and carts and taxis (hanging their legs out of open doors). I have seen them asleep in the middle of their own market stalls. At worst, I have seen a man sleeping on a one foot wide wooden plank which had been hung off railings on the side of a busy vehicular underpass. Boy I wish I could have got a picture of that one...quite unbelievable to see this man fast asleep whilst trucks and buses were bombing past within a hair's breadth of his perfectly balanced body. Asleep on a very public banana stall in Crawford Market. No business to be done evidently! I am not even sure that the desire to sleep in the middle of the day is borne out of a lack of night-time sleep. Perhaps it is the heat of the city, perhaps it is a lack of work, perhaps TOO much work. I expect Mumbai life is just too damn exhausting for them. Do women ever go to sleep in this way? I have never seen it happen. I guess they are too busy managing households and looking after children whilst their husbands are snatching zeds. Or maybe they have too much dignity? 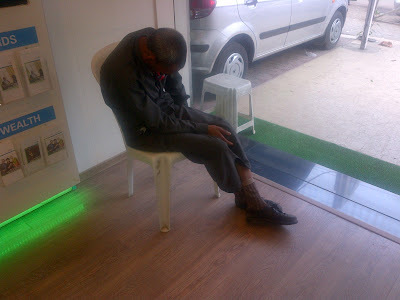 Either way, I always giggle when I see men sleeping in strange places - as it is usually quite comical! Completely out of it - next to a very busy traffic roundabout! A close-up - he even brought his own blanket! This driver's legs are propped up whilst snoozing in his horse-and-cart in Gwalior. A beach vendor napping in the mid-morning sun on Chowpatty Beach, Mumbai - why not eh! Of course.....it's not just humans who like to take a midday nap! Guarding a cash-machine in Bandra...but not very well! I just so happened upon this picture blog today: http://mumbaisleep.tumblr.com/ It contains some beautifully photographed examples of Sleeping Mumbai. Check it out! The picures on the stairs is weird, a bit scary! It really reminds me of Sleeping Beauty when the Princess pricks her finger and everybody in the kingdom falls asleep! I think in China people sleep everywhere too because they work a lot. I suppose it's the same in India. Hello there...gosh yes you do have a point..it's a bit creepy isn't it? Attack of the Zombies! Thanks Good Ink...it took some time!